I haven't been posting much about my jewelry as my Muse has been on vacation for the past several months. However last night she pocked her little head up. Please forgive the pictures. Now I see why people say that Swaroski is hard to photograph. This photo is really washed out. It didn't seem to matter what I did. I wasn't able to get the colors to come thru strongly. 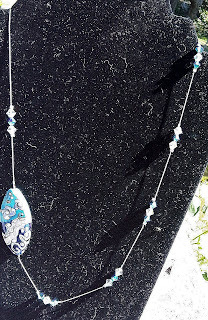 The main color scheme is turquoise with swaroski crystals. This is one that I made for myself with an art bead and swarvoski crystals. I have had this bead for over a year just waiting for the right way to use it. Here is a close up of it. Well a great end to a day that started off not quite so well. 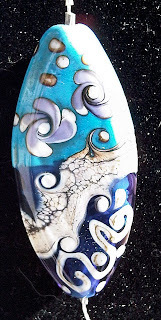 Beautiful bead! 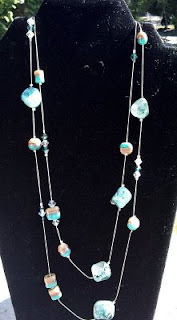 Lovely way you put it together, too...you allowed the art bead to take center stage! Great work!